My latest on Religion in American History, a pedagogical rumination on failures to communicate and teaching the line between the “religious” and “political,” so-called. “African American religion is the invention of scholars who, with particular aims and purposes, seek to describe, analyze, and theorize the religious practices of African Americans under a particular racial regime [white supremacy in the United States]” (8). Glaude’s approach, as well as that of my course, thus “assumes that the political and social context in the United States is a necessary though not sufficient condition of any study of something called African American religion” (7). To this end, we have examined and entered into debates about the inseparability of Christianity, slavery, and slave revolt; imaginings of “Africa” and the construction of African American (religious) identity; and black churches as a counter-public sphere, among other topics. All this is to say that, for my students and myself, the realms of “the religious” and “the political” have never been far from each other. Then we came to the Nation of Islam and these blurred boundaries were built back up in no time. What better example, I had thought, of the impossibility of separating the religious from the political than the Nation of Islam (NOI)? Yet our discussion of Elijah Muhammad and the NOI, along with other “black gods of the Metropolis” as Arthur Huff Fauset termed them, revealed that students were not completely comfortable callin g the Black Muslim movement “religious.” What they read about the NOI struck them as more “political” and “cultural” than “spiritual.” What they saw in the images I provided, such as this one of the Fruit of Islam, seemed to militate against (pun intended) their instinctive understanding of “the religious.” When I asked them to categorize “the religious” – to better articulate what they thought the NOI contained less of – the words brainstormed included morals, belief, worship, faith, and, again, spiritual. Once these words were on the board and out in the open, so to speak, students seemed to waver a bit in their initial assessments. The NOI did, of course, include all of these things. Their point had been made, however. The NOI challenged their working definitions of “religion,” particularly with regard to the boundaries between what constitutes “the religious” and what constitutes “the political.” It left them, in short, bamboozled. Now, this novice professor will be the first to admit that what we’ve got here, this problem of deciphering how the religious relates to the political, stems in part from a failure to communicate. (As we all no doubt do, I’m already thinking through different in-class exercises designed to interrogate these assumptions further.) Nevertheless, I find these moments of discomfort instructive. The NOI conjures cognitive dissonance for students, something I’ve experienced in other classes as well (and I’d be interested to hear if others have had similar experiences). Why is this? Proximity is part of it. It is often the newness of new religious movements that makes them suspect to outsiders. Most students are less comfortable with the thought of gods and prophets walking the streets of 1930s Detroit and Chicago than first-century Palestine. But, in this particular class, it seemed the specter of “the spiritual” reigned. 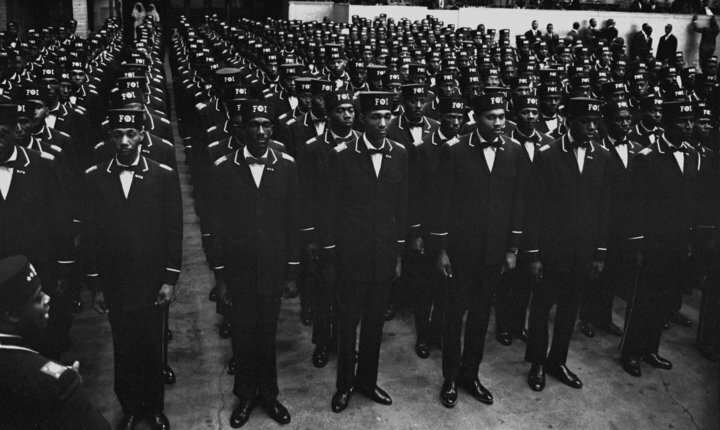 The Nation of Islam was deemed not religious, or at least less religious, because its basis was not spiritual but cultural and political – a statement I took to mean that the NOI was born of a (nationalist) critique of white supremacy, not a belief in Allah or an interpretation of the Qur’an. This assertion, of course, is not new. It served as justification for the Federal Bureau of Investigation’s surveillance and disruption of the NOI and other new religious movements, like the Moorish Science Temple of America, that the FBI labeled “black nationalist hate-type organizations.” This is something I’ve blogged about here and that Emily Suzanne Clark recently referenced. It is also akin to what Mike Altman meant when he blogged on Citizenfour, surveillance, and how “religion became a space for managing dissent.” If “religion” as a modern category is meant to establish boundaries around certain phenomena in order to distinguish them from things deemed properly political, it seems to me that “the spiritual” removes those phenomena even further from the realm of politics and power. These are issues the Fourth Biennial Conference on Religion and American Culture is poised to address, with panels on What do we mean by “religion” in a time of “spirituality,” “lived religion,” and “non-religion”? and Whither New Religious Movements? In the meantime, I plan to have my students help me categorize the Nation of Islam one more time. Our source: Elijah Muhammad speaking on “what the Muslim wants and believes.” The only words they can’t use to describe it: religious and political.